Mission Free Iran is opening a campaign called “Tuesdays of Solidarity: Together for Freedom of Political Prisoners in Iran until the Fall of the Regime.” Tuesday is the day of the week when families, friends, and loved ones gather outside of the regime’s prisons to wait for the chance to see their imprisoned beloved. We will mark each and every Tuesday from now until the fall of the Islamic Republic regime with activism and acts of solidarity in support of political prisoners in Iran. The campaign’s opening call appears below. The organizational structure for the campaign follows; we are seeking additional activists to contribute their energy and skills to the campaign. Email Ahmad Fatemi if you are interested in joining the campaign organization. The Islamic regime continues without pause to arrest, detain, torture and execute our beloved inside its prisons. And every Tuesday, without fail, the families of people imprisoned for demanding freedom,social and economical justice gather outside the Islamic jails, Evin, Gohardasht, Kahrizak, Sanandaj and others all across this bloodied land. These families gather outside prison gates throughout Iran. They wait, hope against hope, for the opportunity to see their son or daughter, sister or brother, mother or father. Some travel hundreds of kilometers just for the chance to visit their loved ones for a few minutes. Some have waited for over 10 years to hear about the fate of their loved ones. Some come here to demand the body of their executed. Some come here to help the desperate mothers, fathers, children or spouses to shoulder the burden. Many come here to mark the day when all of these walls will be brought down, this bloody land of 32 painful years of Islamic savagery never again to have a political prison! They gather. They wait. On Tuesdays outside the prisons. Let us join them, wherever we are! Join them every Tuesday, wherever we are, until the gates cannot hold us back! Until the guards dare not to stop our loved ones from walking out of the corridors of the Islamic torture houses to the bosom of freedom that has waited for them so impatiently, so long! We call on honorable people across Iran to join the families of political prisoners as they keep their Tuesday vigils. Add your voices to theirs as they demand the immediate and unconditional release of their beloved, of each and every political prisoner in Iran. Stand together and with one voice declare that there should not be even one more execution in Iran. 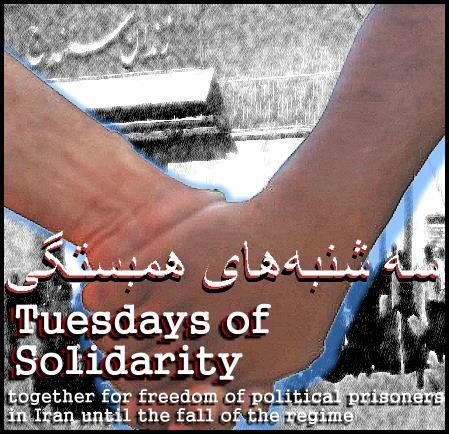 Come together on Tuesdays outside the prison gates in every city in Iran and join your hands, hearts and minds in solidarity with the families of the unjustly imprisoned by the Islamic Republic of Stoning, Torture, and Death. « Swedish Government’s Attempt to Deport Peyman Najafi Halted; All Hands on Deck for Navid Mirpourzadih!